Who invented Jeans? Jeans was invented by Jacob Davis (1831-1908) and Levi Strauss (1829 -1902). It was Jacob Davis who had the idea of making durable denim pants with rivets to hold them together and Levi Strauss who provided the financial backing to market the idea. The first jeans were introduced in 1968 to California Gold Rush miners and the hard wearing jeans were so popular that Jacob Davis and Levi Strauss went into partnership. Jacob Davis filed for a patent for his idea of using 'copper rivet fasteners for denim trousers'. The patent application was jointly assigned to himself and to Levi Strauss & Company and was granted, U.S. Patent No. 139,121, on May 20, 1873. Definition of Jeans: Jeans are defined as casual, hard wearing trousers, typically made from denim cloth that is colored blue with indigo dye. 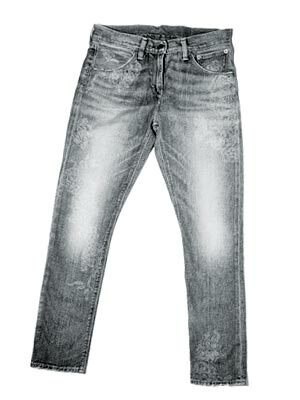 The word "Jeans" comes from the French word 'Genes' meaning Genoa, Italy where the first denim trousers were made. Genoese traders exported 'serge de Nimes', made of silk and wool, to Britain in the 1600's and mills in the American colonies began to manufacture denim, made from cotton yarns, in the 1700's. Fact 1: Who invented Jeans? The Jeans was invented by Jacob Davis and Levi Strauss in 1873 during the Second US Industrial Revolution era of inventions (1850 - 1914). Fact 2: Who invented Jeans? Prior to the invention of Jeans in 1873, George Houghton and L. K. Washburn had both received patents in the late 1860's for using rivets for securing seams in shoes. But it was Jacob Davis that had the idea of using rivets, a short metal pin for fastening two or more pieces together, in the manufacture of clothes. Fact 3: Who invented Jeans? The history of denim jeans began when Jacob Davis applied copper rivets to stress points on work pants. His pants were so popular that he could not keep up with demand and he approached Levi Strauss to provide financial backing for the novel idea in order to pay $68 for a US patent to protect the idea and to manufacture the product. Fact 4: Who invented Jeans? Jacob Davis was born Jacob Youphes in the city of Riga, part of the Russian Empire, now called Latvia, in 1831. Jacob Davis came from a family of Jewish tailors and his early years were spent learning to be a tailor. Fact 5: Who invented Jeans? Levi Strauss was born Lob Straus in Buttenheim, Germany, on February 26, 1829. His parents were to Hirsch Strauss and his second wife, Rebecca Haas Strauss. The Strauss family decided to emigrate to America and started a wholesale dry goods business called J. Strauss Brother & Co. Levi Strauss emigrated to America in 1846 and joined his brothers in the family business. Fact 6: Who invented Jeans? Jacob Davis also decided to emigrate to America and in 1854 arrived in New York where he established a small tailoring business. Jacob Davis married Annie Parksher, and together, Jacob and Annie Davis had six children. Fact 7: Who invented Jeans? The paths of Jacob Davis and Levi Strauss were destined to cross due to the California Gold Rush (1848–1855) which started when James Marshall discovered gold at Sutter's timber Mill in California on January 24, 1848 and gold fever hit San Francisco. Over 90,000 gold-seekers flock to the Californian goldfields in 1849 and become known as the "Forty-Niners". Fact 8: Who invented Jeans? San Francisco became a boom town and in 1853 Levi Strauss moved to San Francisco and opened his own dry goods wholesale business as Levi Strauss & Co., which also served as the West Coast representative of the family’s New York business. Fact 9: Who invented Jeans? Jacob Davis and his family moved to San Francisco in 1867 where Jacob Davis worked in his small tailoring business and became a customer of Levi Strauss & Co. who supplied him with the cloth and fabrics he needed to run his tailoring business. Fact 10: Who invented Jeans? Jacob Davis sewed items of clothing and also other functional items such as tents, wagon covers and horse blankets. Fact 11: Who invented Jeans? Levi Strauss & Co. supplied the hard-wearing cloth, such as canvas and denim, to Jacob Davis. Fact 12: Who invented Jeans? Canvas is a waterproof material with a tight weave which makes the material somewhat stiff. Denim is not as durable as canvas and does not retain dyes as well, but resists tears and creases easily. Jacob Davis used canvas to make tents and wagon covers. Denim, unlike canvas, softens with wear and makes more comfortable clothes so Jacob Davis chose this material to make clothes for labourers. Fact 13: Who invented Jeans? Business for Levi Strauss & Co. was flourishing but Jacob Davis found that his business was floundering. The California gold rush had eased by 1855 as the gold output stabilized and Jacob Davis missed his chance to capitalize on the California Gold Rush. Fact 14: Who invented Jeans? In 1865 silver was discovered in Nevada and other workers flocked to the area with the construction of the Transcontinental Railroad (1863 - 1869). Jacob Davis made the decision to move to Nevada where he eventually opened a tailors shop in Reno. Fact 15: Who invented Jeans? The invention of Jeans by Jacob Davis came about by accident. His customers were all laborers who had little money to spend on clothes. Tools, spikes, nails, rocks and pieces of rock often found their way into the trouser pockets of the men. Not surprisingly the pockets of trousers easily tore and hard manual labor resulted in ripped seams. Fact 16: Who invented Jeans? The wife of a lumberjack asked Jacob Davis if he could make a pair of really strong, durable working pants for her husband. His 'Eureka' moment for making reinforced jeans came when he was about to finish making the denim jeans. He had used copper rivets as fasteners to reinforce hose blanket straps he made for local teamsters and some of the rivets had been left were lying on the table. Jacob Davis used the rivets to fasten the pockets of the jeans. Fact 17: Who invented Jeans? The customer was delighted with the reinforced jeans. Word spread and before long Jacob Davis was unable to keep up with the demand for his reinforced denim jeans. He needed financial support and turned to his supplier, Levi Strauss, for help. Fact 18: Who invented Jeans? Levi Strauss recognized the need for heavy work clothing and its potential for profit and the two men applied for a patent to protect the idea. Fact 19: Who invented Jeans? They filed for a patent for using 'copper rivet fasteners for denim trousers'. The patent application was jointly assigned to Jacob Davis and to Levi Strauss & Company and was granted, U.S. Patent No. 139,121, on May 20, 1873. Fact 20: Who invented Jeans? A new specification forming part of Letters Patent No. 139,121, was reissued on March 16,1875 in which Jacob Davis stated "My invention is applicable to pantaloons, overalls, coats, vests, and other garments". Fact 21: Who invented Jeans? The first Jeans were a muddy brown color but as Jacob Davis and Levi Strauss worked to improve their jeans they found that an indigo blue color was more popular. Fact 22: Who invented Jeans? The invention of denim blue Jeans was a great success. Jacob Davis moved back to San Francisco to run the large tailor shop that had been established by Levi Strauss. The shop was enable to meet demand and a mass production factory was opened which was also managed by Jacob Davis. Fact 23: Who invented Jeans? The invention of Jeans resulted in both Jacob Davis and Levi Strauss becoming extremely wealthy men. Jacob Davis sold his interest in the patent and the manufacturing to Levi Strauss. Fact 24: Who invented Jeans? Both men remained in San Francisco until the end of their lives. Levi Strauss died on September 26, 1902 and Jacob Davis died in 1908. Fact 25: Who invented Jeans? Denim Jeans were only worn by manual workers for many years but in the 1950's, with the influence of the movies, became a fashion staple and the 1960's saw jeans becoming the fashion province of the younger generation with style innovations such as pre-shrunk jeans and flared jeans. Stone washed skinny jeans emerged as the new fashion trend of the 1970's. Fact 26: Who invented Jeans? Later fashions involving jeans saw the rebellious style of distressed, "acid wash" denim jeans and the 'ripped jeans' look and grunge fashion. Designer jeans by notable fashion designers produce expensive jeans such as Armani, D&G jeans, Gucci, Roberto Cavalli Jeans, Escada, APO Jeans and Diesel. Fact 27: Who invented Jeans? Whatever the latest fashion in style and design might be denim jeans invented by Jacob Davis and Levi Strauss are here to stay. Who Invented Jeans - Jacob Davis and Levi Strauss - Inventor - Invention - Definition - Jeans History - Meaning - Famous - Innovation - Important - Significant - Jeans History - Development - Clothing - First - Definition - Kids - Amazing - Best - Facts - Information - Info - Who invented Jeans? - Dates - When - Why - Impact - Purpose - Use - Interesting - New - Old - Definition - American - Jeans History - Who invented Jeans?